If Hamlet were alive today, he’d probably be running a mobile app startup, not a Danish kingdom. And he might be having this conversation about whether to localize with himself, which is the same conversation we at El Loco, localization providers, have had with some of our initially reluctant clients. You say: We cannot afford translators. We say: Almost any human translation is better for the customer than no translation. Imagine a product you needed to use but was only available in Japanese (and you don’t understand Japanese). You’d be grateful for even a bad machine-language translation into English than nothing at all. Yes, professional translators are not cheap, but there are less costly options: finding translators among family and friends as well as searching online for native speaker freelancers. You say: Our developers have tight deadlines and cannot spend any time on translations. We say: Yes, in the past, getting your app set up to be localized could take some time. That is not as true today. Your developer can probably manage the entire process while sitting in weekly group meetings or getting coffee. And as for handling text overruns that occur with strings on each screen, El Loco provides a tool for expediting the review process. You say: We don’t have the resources to translate our web site. We say: You don’t have to translate your web site. Your app is your sales channel. Someone shows someone your app and they decide to give it a try. There is no web site interaction in that sales process. Word of mouth drives sales. You say: We can’t provide customer support in other languages. You say: The global English language market is big enough for us. You say: Our customers live in the U.S., where everyone speaks English. We say: The CIA estimates that in the U.S., 79 percent speak English and almost 13 percent speak Spanish. And in California – the world’s sixth biggest economy, according to the Wall Street Journal — more like 38 percent of the population is Latino. English-only apps miss a significant segment of the Spanish-speaking market in the U.S..
You say: What if the translations were NSFW (not safe for work). We say: Ask around. You have friends or customers who would be happy to review a translation via the El Loco web site and alert you if the translation was not appropriate for public release. You say: We don’t have the funds to translate all our product brochures. We say: Don’t. Yes, translate the App Store description. People using your app don’t care about your product brochures. You say: We have too much content that would need to be translated. We say: Most content – such as price, product name, color, photos, etc. — comes from a database and requires no translation. So your product descriptions or stories are not going to be translated. OK, it’s not perfect. Having the app translated, even if the content is not 100 percent translated, is better than no translations. You say: We have a lot of voice work we’d have to record in other languages. We say: This could be expensive but game companies have found a cheaper alternative: they translate all the displayed text but keep the voice work in English. Again, it’s not perfect, but if the characters are English speakers anyway, you can get away with it. 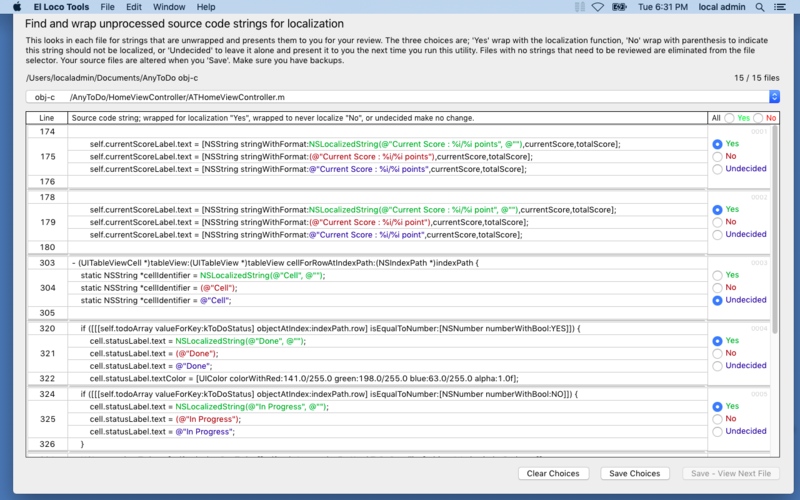 Start localizing your iOS app. Add a couple of languages. Find people who can do the translation for free and see what happens. Your customers will be pleasantly surprised, and who knows, you might like all the extra money you get from those new markets.